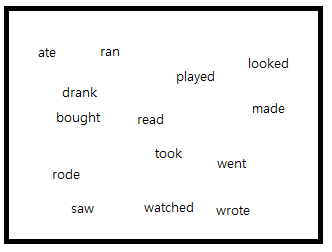 ESL Past Tense Activities & free PowerPoint to download! Here are 3 easy past tense practice activities for the ESL classroom - they are so easy, and require very little preparation. Hope they help! So for a past tense based lesson I didn't have to prepare anything beforehand. I just wrote, with the help of student suggestions, a bunch of past tense verbs on the whiteboard. Next, I separated the class into two teams and got them to make two single file lines facing the white board. Then I told the students that I would call out the present tense word and they had to hit the correct past tense word with their giant plastic hammer. The game factor is that the first team member to hit the correct past tense word earns a point for their team. It worked well because every student had a chance to play as they were all lined up taking turns to hit with their team's hammer. (So, 2 students play against each other at a time). Note: It is important to explain that the spelling of 'read' in past tense doesn't change - only it's pronunciation. Hence, it's important to have 'read' up on the whiteboard during this game so they can listen to the difference. As the teacher you might call out "see" and the students have to hit 'saw' on the white board with their hammer, whoever (out of the 2 team reps) hits 'saw' first, wins a point for their team. Then change to the next 2 competitors in line. Not an original idea but I reminder for you to try it out. This again, super simple - I had the students offer to volunteer to come up and draw on the white board. What do they draw? Well, I whisper to the volunteers a past tense sentence and they draw what they can on the board in order for their classmates to guess and say the correct past tense sentence. This is a good way to revise complete sentences as well as past tense words. 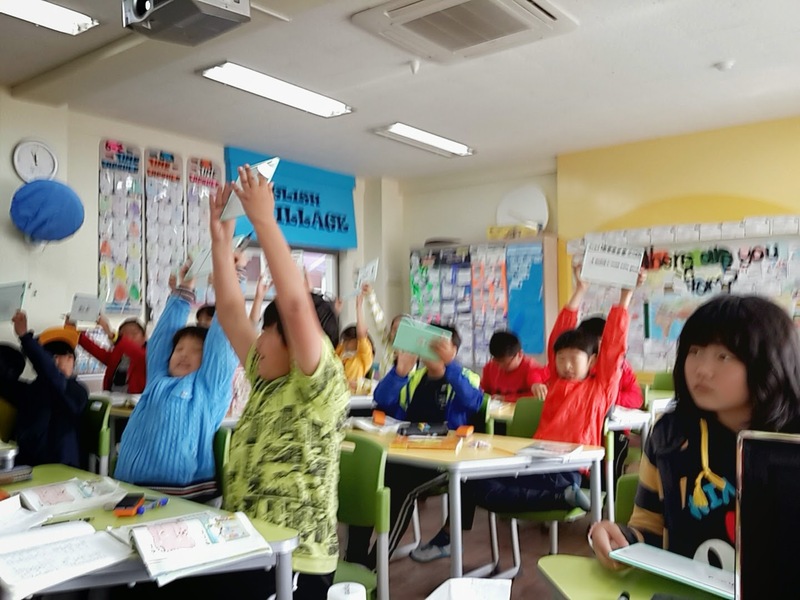 They are usually tempted to say the sentence in present tense but then the class will get in a frenzy trying to remember the correct past tense phrase. Simple, easy, fun and effective. I went shopping and bought a bag. Or I went to the zoo and saw elephants. A point system for this drawing activity is optional but I didn't need it, the kids still had fun just guessing as a class. Activity Three: Spelling and Completing Sentences 'Game'. Slightly a game... but more a mini test. The kids had a lot of fun with this activity and I think it was a very useful way to practice past tense words as well as sentence structure. Now, there is a little prep involved but luck has it - you can download my PowerPoint ! You will also need mini white boards & markers, or just pencils & paper/notebooks ...but the whiteboards make it more fun. The activity works easily. 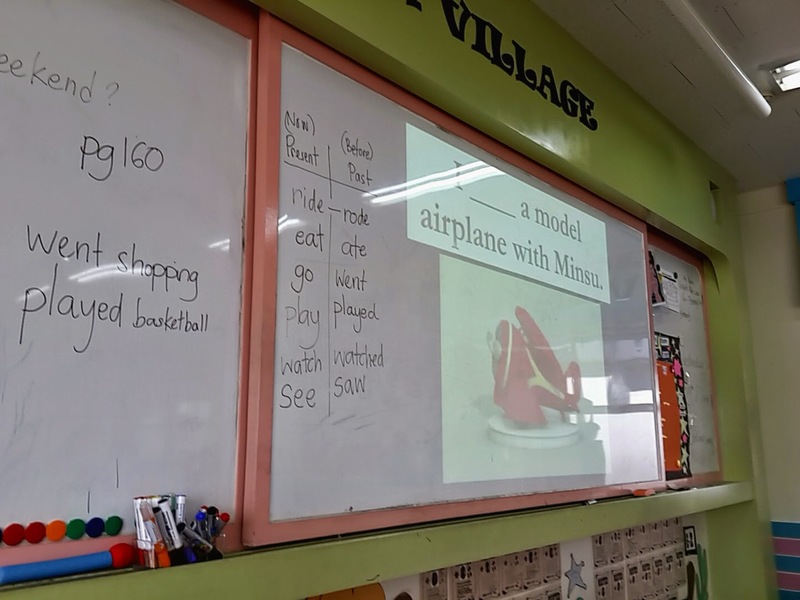 I have the PPT projected and each slide has a sentence with a missing word (the past tense word of course) and the students must finish the sentence. The students must make the sentence past tense with correct spelling. They have a minute to write down their answer on their mini whiteboard and when I count down from 5 and say "show me" they show their whiteboard and we compare our answers. I liked having a student with the correct answer come up to the whiteboard and fill in the blank. I also told them to note down a point every time the got it correct. At the end of the class I survey who has the most points and if I'm feeling generous I give candy/or a gold star to those who get the most. Showing their answers with pride! As you can see I go over the answer, reviewing the present tense and past tense word on the board also. Note: some sentences have multiple answers, this is fine to encourage I say, get them thinking. I put gifs onto the powerpoint, if you have issues with any let me know and I'll try upload links to them here. Thank you so much! I'm going to try this out tomorrow.